Salad greens and other salad vegetables must be stored correctly to retain freshness and quality. Do not wash any vegetables before storing. Salad vegetables should be stored in the vegetable compartment or on the lower shelves of the refrigerator. The important point is to cover their surface to prevent moisture loss. Preheat oven to 180°. Combine butternut pumpkin, maple syrup, sunflower seeds and olive oil in a bowl. Place on a lined baking tray and season with salt and pepper. Roast pumpkin for about 20 minutes or until soft. Prepare the dressing. Place all ingredients in a screw-top jar and shake to combine. 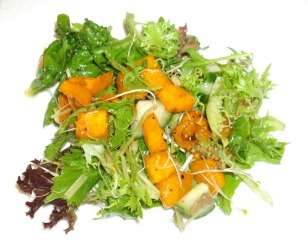 In a salad bowl, combine salad leaves, cucumber and alfalfa, add roasted pumpkin and dressing and toss to combine. Use walnuts instead of sunflower seeds. Wash salad leaves, pat dry and roll up in a damp cloth. Place in the refrigerate for about 1 hour or until ready to serve. In a small bowl, combine the remaining ingredients and drizzle over the salad. Enjoy! Place rinsed and dried spinach leaves, grapefruit, onion, and cabbage into a salad bowl and toss well. Combine the remaining ingredients in a small bowl and pour over the salad. Toss lightly and serve. Combine tomatoes and onion. Add coarsely chopped basil leaves and season with salt and pepper. Ready to serve. 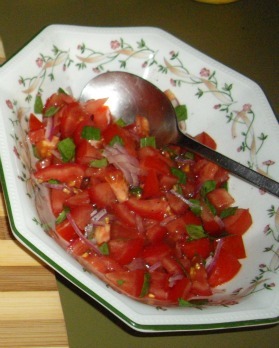 Use vine ripened tomatoes for best taste.